The office at Cobb Management will close for the Christmas period from 12 noon on Friday 22nd December and we will re-open for business at 9am on Tuesday 2nd January 2018. PLEASE NOTE: Phone calls will not be directly answered, but we will endeavour to respond to urgent messages and emails during this period. We are pleased to say that we have had another busy year of growth, including a move to new premises, the addition of another member of staff and the introduction of our new Lettings Service. We have also seen an increase in Survey instructions and have been delighted to be appointed as Managing Agent for a number of Residential Developments in Poole, Canford Cliffs and Lower Parkstone. We look forward to helping many more new clients in 2018. 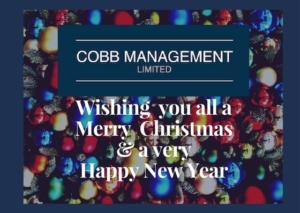 From all of us at Cobb Management we wish you a very Merry Christmas and a Happy New Year. We would like to thank you for your support this year and we look forward to working with you in 2018.